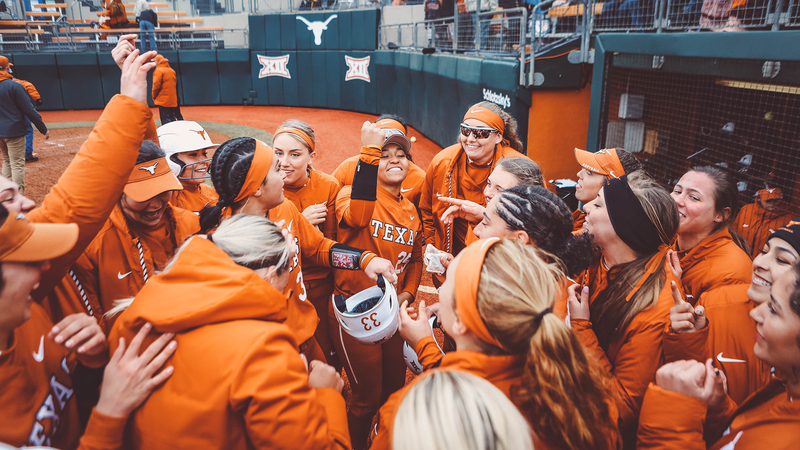 The Texas Softball team went 4-0 over the weekend during the Texas Classic, pummeling their four opponents by a combined score of 32-3 (Photo courtesy of Texas Sports). AUSTIN — Though the wet weather may have postponed the start of the season, there was no delaying the display of just how dominant the Texas Softball team can be this year. Hosting the Texas Classic at Red and Charline McCombs Field this weekend, the Longhorns won all four of their games by a whopping total of 32-3. The squad set some Texas history as well, becoming the first team to win three games in one day in 23 years. No. 16 Texas (4-0) were a level above the competition on the mound and in the batter’s box as Texas accumulated a .378 batting average over the four games and walloped 11 extra-base hits. Meanwhile the arms in the circle held the four foes to minimal damage, finishing the weekend with a 0.64 combined ERA with two one-hit shutouts to boot. The transfers that followed head coach Mike White from Oregon to Texas made their presence known throughout the weekend. The Longhorns concluded the tournament weekend with a 9-1 win over Boston College Sunday afternoon, taking the game in just five innings as freshman right-hander Shealyn O’Leary gave up a mere run on four hits in four innings of work. OH WHAT A CHANGE-UP from @sheabug29 to end the top of the third! That's just filthy! Sophomore catcher Mary Iakopo, who transferred to Texas, gave O’Leary all the support she’d need with a two-run homer in the bottom of the first inning, a frame which saw Texas put up an eight-spot for a commanding early lead. Nifty baserunning put the game away in the bottom of the fifth as the Longhorns won by run-ruling the Eagles. With two outs and two on, Shannon Rhodes took off to steal second base, prompting a misfire from BC catcher Gianna Boccagno that sailed into center field and allowed Janna Roberts, who had walked earlier, to dash home from third base for the winning run. On Saturday’s three-win day, the ‘Horns started with a 8-0 win over Boston College to bookend the weekend, then Texas took down Northwestern State 7-2, and beat Boise State 8-0. In White’s first-career win as the Texas coach, the 8-0 victory over the Eagles, junior third baseman Shannon Rhodes went 2-for-2 with a double and two RBIs while Miranda Elish went 1-for-2 with a run scored and an RBI. The returning Longhorns had a big hand in the win as well. Senior hurler Brooke Bolinger went the full five innings in the run-rule win, giving up just one hit with seven strikeouts. Junior first baseman Kaitlyn Washington and sophomore second baseman Janae Jefferson each getting two RBIs. In the win over Boise State, it was Elish who dominated with five innings of one-hit ball as six different Longhorns had an RBI in the win. Junior DH Taylor Ellsworth led the way going 2-for-3 with three RBIs. Elish faced the bare minimum 15 batters even with allowing the single, as she induced a double-play grounder to erase the lone runner. M5 | FIRST TEXAS K for @elish_miranda! She's faced the minimum through five innings. The final game on Saturday actually started out a lot closer than it wound up, as the score was knotted at 1-1 in the fourth inning before Texas blew it open en route to the 7-2 victory. Redshirt junior center fielder Reagan Hathaway led the way, going 2-for-4 with two doubles and three RBIs as she showed she’s back to being fully healthy after two years mostly away from the diamond because of injuries. Sophomore Ariana Adams earned the win by allowing just one run with three strikeouts in four innings, while Bolinger got the save going three frames with six strikeouts. With the game tied 1-1 in the fourth, sophomore MK Tedder gave Texas the lead for good with am RBI single to make it 2-1 before Iakopo had a two-run single an Hathway belted her two-run double to make it a 6-1 contest. Texas now travels to play in the St. Pete/Clearwater Elite Invitational in Clearwater, Flor. The ‘Horns play California at noon on Thursday, then play two on Friday against Florida Atlantic at 11:30 a.m. and taking on LSU at 3 p.m. Texas concludes the tourney taking on Kentucky bright and early Saturday morning, facing Kentucky at 9 a.m.